This article is about extreme malnutrition. For other uses, see Starvation (disambiguation). Starvation is a severe deficiency in caloric energy intake, below the level needed to maintain an organism's life. It is the most extreme form of malnutrition. In humans, prolonged starvation can cause permanent organ damage and eventually, death. The term inanition refers to the symptoms and effects of starvation. Starvation may also be used as a means of torture or execution. A girl during the Nigerian Civil War of the late 1960s, shown suffering the effects of severe hunger and malnutrition. According to the World Health Organization, hunger is the single gravest threat to the world's public health. The WHO also states that malnutrition is by far the biggest contributor to child mortality, present in half of all cases. Undernutrition is a contributory factor in the death of 3.1 million children under five every year. Figures on actual starvation are difficult to come by, but according to the Food and Agriculture Organization, the less severe condition of undernourishment currently affects about 842 million people, or about one in eight (12.5%) people in the world population. The bloated stomach represents a form of malnutrition called kwashiorkor. The exact pathogenesis of kwashiorkor is not clear, as initially it was thought to relate to diets high in carbohydrates (e.g. maize) but low in protein. While many patients have low albumin, this is thought to be a consequence of the condition. Possible causes such as alfatoxin poisoning, oxidative stress, immune dysregulation and altered gut microbiota have been suggested. Treatment can help mitigate symptoms such as the pictured weight loss and muscle wasting, however prevention is of utmost importance. Early symptoms include impulsivity, irritability, and hyperactivity. Atrophy (wasting away) of the stomach weakens the perception of hunger, since the perception is controlled by the percentage of the stomach that is empty. Individuals experiencing starvation lose substantial fat (adipose tissue) and muscle mass as the body breaks down these tissues for energy. Catabolysis is the process of a body breaking down its own muscles and other tissues in order to keep vital systems such as the nervous system and heart muscle (myocardium) functioning. The energy deficiency inherent in starvation causes fatigue and renders the victim more apathetic over time. As the starving person becomes too weak to move or even eat, their interaction with the surrounding world diminishes. In females, menstruation ceases when the body fat percentage is too low to support a fetus. Victims of starvation are often too weak to sense thirst, and therefore become dehydrated. All movements become painful due to muscle atrophy and dry, cracked skin that is caused by severe dehydration. With a weakened body, diseases are commonplace. Fungi, for example, often grow under the esophagus, making swallowing painful. Vitamin deficiency is also a common result of starvation, often leading to anemia, beriberi, pellagra, and scurvy. These diseases collectively can also cause diarrhea, skin rashes, edema, and heart failure. Individuals are often irritable and lethargic as a result. There is insufficient scientific data on exactly how long people can live without food. Although the length of time varies with an individual's percentage of body fat and general health, one medical study estimates that in adults complete starvation leads to death within 8 to 12 weeks. There are isolated cases of individuals living up to 25 weeks without food. Starvation begins when an individual has lost about 30% of their normal body weight. Once the loss reaches 40% death is almost inevitable. Starved Vietnamese man, who was deprived of food in a Viet Cong prison camp. Note the rib cage showing, a clear sign of starvation. With a typical high-carbohydrate diet, the human body relies on free blood glucose as its primary energy source. The level of blood sugar is tightly regulated; as blood glucose is consumed, the pancreas releases glucagon, a hormone that stimulates the liver to convert stored glycogen into glucose. The glycogen stores are ordinarily replenished after every meal, but if the store is depleted before it can be replenished, the body enters hypoglycemia, and begins the starvation response. After the exhaustion of the glycogen reserve, and for the next 2–3 days, fatty acids become the principal metabolic fuel. At first, the brain continues to use glucose. If a non-brain tissue is using fatty acids as its metabolic fuel, the use of glucose in the same tissue is switched off. Thus, when fatty acids are being broken down for energy, all of the remaining glucose is made available for use by the brain. After 2 or 3 days of fasting, the liver begins to synthesize ketone bodies from precursors obtained from fatty acid breakdown. The brain uses these ketone bodies as fuel, thus cutting its requirement for glucose. After fasting for 3 days, the brain gets 30% of its energy from ketone bodies. After 4 days, this goes up to 75%. Thus, the production of ketone bodies cuts the brain's glucose requirement from 80 g per day to about 30 g per day. Of the remaining 30 g requirement, 20 g per day can be produced by the liver from glycerol (itself a product of fat breakdown). But this still leaves a deficit of about 10 g of glucose per day that must be supplied from some other source. This other source will be the body's own proteins. After exhaustion of fat stores, the cells in the body begin to break down protein. This releases alanine and lactate produced from pyruvate into the bloodstream, which can be converted into glucose by the liver. Since much of human muscle mass is protein, this phenomenon is responsible for the wasting away of muscle mass seen in starvation. However, the body is able to selectively decide which cells will break down protein and which will not. About 2–3 g of protein has to be broken down to synthesize 1 g of glucose; about 20–30 g of protein is broken down each day to make 10 g of glucose to keep the brain alive. However, this number may decrease the longer the fasting period is continued in order to conserve protein. Starvation ensues when the fat reserves are completely exhausted and protein is the only fuel source available to the body. Thus, after periods of starvation, the loss of body protein affects the function of important organs, and death results, even if there are still fat reserves left unused. (In a leaner person, the fat reserves are depleted earlier, the protein depletion occurs sooner, and therefore death occurs sooner.) The ultimate cause of death is, in general, cardiac arrhythmia or cardiac arrest brought on by tissue degradation and electrolyte imbalances. Supporting farmers in areas of food insecurity through such measures as free or subsidized fertilizers and seeds increases food harvest and reduces food prices. Starving patients can be treated, but this must be done cautiously to avoid refeeding syndrome. Rest and warmth must be provided and maintained. Small sips of water mixed with glucose should be given in regular intervals. Fruit juices can also be given. Later, food can be given gradually in small quantities. The quantity of food can be increased over time. Proteins may be administered intravenously to raise the level of serum proteins. Many organizations have been highly effective at reducing starvation in different regions. Aid agencies give direct assistance to individuals, while political organizations pressure political leaders to enact more macro-scale policies that will reduce famine and provide aid. According to estimates by the Food and Agriculture Organization there were 925 million under- or malnourished people in the world in 2010. This was a decrease from an estimate of roughly 1 billion malnourished people in 2009. In 2007, 923 million people were reported as being undernourished, an increase of 80 million since 1990-92. It has also been recorded that the world already produces enough food to support the world's population. As the definitions of starving and malnourished people are different, the number of starving people is different from that of malnourished. Generally, far fewer people are starving, than are malnourished. The proportion of malnourished and of starving people in the world has been more or less continually decreasing for at least several centuries. This is due to an increasing supply of food and to overall gains in economic efficiency. In 40 years, the proportion of malnourished people in the developing world has been more than halved. The proportion of starving people has decreased even faster. Historically, starvation has been used as a death sentence. From the beginning of civilization to the Middle Ages, people were immured, or walled in, and would die for want of food. In ancient Greco-Roman societies, starvation was sometimes used to dispose of guilty upper class citizens, especially erring female members of patrician families. For instance, in the year 31, Livilla, the niece and daughter-in-law of Tiberius, was discreetly starved to death by her mother for her adulterous relationship with Sejanus and for her complicity in the murder of her own husband, Drusus the Younger. A son and daughter of Agrippina were also executed by starvation for political reasons; Drusus Caesar, her second son, was put in prison in 33 AD, and starved to death by orders of Tiberius (he managed to stay alive for nine days by chewing the stuffing of his bed); Agrippina's youngest daughter, Julia Livilla, was exiled on an island in 41 by her uncle, Emperor Claudius, and subsequently her death by starvation was arranged by the empress Messalina. It is also possible that Vestal Virgins were starved when found guilty of breaking their vows of celibacy. 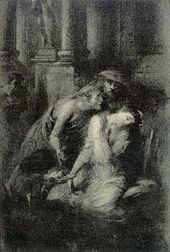 Ugolino della Gherardesca, his sons and other members of his family were immured in the Muda, a tower of Pisa, and starved to death in the thirteenth century. Dante, his contemporary, wrote about Gherardesca in his masterpiece The Divine Comedy. In Sweden in 1317, King Birger of Sweden imprisoned his two brothers for a coup they had staged several years earlier (Nyköping Banquet). According to legend they died of starvation a few weeks later, since their brother had thrown the prison key in the castle moat. In Cornwall in the UK in 1671, John Trehenban from St Columb Major was condemned to be starved to death in a cage at Castle An Dinas for the murder of two girls. The Makah, a Native American tribe inhabiting the Pacific Northwest near the modern border of Canada and the United States, practiced death by starvation as a punishment for slaves. Many of the prisoners died in the Nazi concentration camps through deliberate maltreatment, disease, starvation, and overwork, or were executed as unfit for labor. Many occupants of ghettos in eastern Europe also starved to death, most notoriously in the Warsaw ghetto. Prisoners were transported in inhumane conditions by rail freight cars, in which many died before reaching their destination. The prisoners were confined to the cattle cars for days or even weeks, with little or no food or water. Many died of dehydration in the intense heat of summer or froze to death in winter. Nazi concentration camps in Europe from 1933 to 1945 deliberately underfed prisoners, who were at the same time forced to perform heavy labour. The diet was restricted to watery vegetable soup and a little bread, with little or no dietary fats, proteins or other essential nutrients. Such treatment led to loss of body tissues, and prisoners became skeletal, the so-called Muselmann who were murdered by gas or bullet when examined by camp doctors. Starvation was also used as a punishment where victims were locked into a small cell until dead, a process which could take many days. 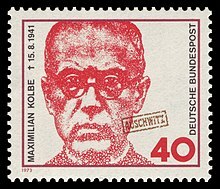 Saint Maximilian Kolbe, a martyred Polish friar, underwent a sentence of starvation in Auschwitz concentration camp in 1941. Ten prisoners had been condemned to death by starvation in the wake of a successful escape from the camp. Kolbe volunteered to take the place of a man with a wife and children. After two weeks of starvation, Kolbe and three other inmates remained alive; they were then executed with injections of phenol. ^ Disease-Related Malnutrition: An Evidence-Based Approach to Treatment "When [food] intake is poor or absent for a long time (weeks), weight loss is associated with organ failure and death." ^ "Hunger Stats". World Food Programme. ^ "With spirulina, and together, we will end child malnutrition in the world. Now". Retrieved Dec 16, 2014. ^ Hoffman, Matthew (2014). "How long can you live without food?". Answers. WebMD, LLC. Retrieved October 5, 2014. ^ Bernhard, Virginia (2011). A Tale of Two Colonies: What Really Happened in Virginia and Bermuda?. University of Missouri Press. p. 112. ISBN 0826272576. ^ Bydlowska, Jowita (2013). Drunk Mom: A Memoir. Doubleday Canada. p. 91. ISBN 0385677812. ^ a b Time magazine, November 11, 1974, cited in Pojman, Paul; Pojman, Louis (2011). Food Ethics. Cengage Learning. p. 128. ISBN 1111772304. ^ C. J. Coffee (Dec 1, 2004). Quick Look: Metabolism. Hayes Barton Press. p. 169. ^ Mehanna HM, Moledina J, Travis J (June 2008). "Refeeding syndrome: what it is, and how to prevent and treat it". BMJ. 336 (7659): 1495–8. doi:10.1136/bmj.a301. PMC 2440847. PMID 18583681. ^ Food and Agriculture Organization Economic and Social Development Department. “The State of Food Insecurity in the World, 2008 : High food prices and food security - threats and opportunities”. Food and Agriculture Organization of the United Nations, 2008, p. 2. “FAO’s most recent estimates put the number of hungry people at 923 million in 2007, an increase of more than 80 million since the 1990–92 base period.”. ^ Fogel, RW (2004). The escape from hunger and premature death, 1700-2100: Europe, America, and the Third World. Cambridge: Cambridge University Press. ^ Food and Agriculture Organization Agricultural and Development Economics Division. “The State of Food Insecurity in the World, 2006 : Eradicating world hunger – taking stock ten years after the World Food Summit”. Food and Agriculture Organization of the United Nations, 2006, p. 8. “Because of population growth, the very small decrease in the number of hungry people has nevertheless resulted in a reduction in the proportion of undernourished people in the developing countries by 3 percentage points – from 20 percent in 1990–92 to 17 percent in 2001–03. (…) the prevalence of undernourishment declined by 9 percent (from 37 percent to 28 percent) between 1969–71 and 1979–81 and by a further 8 percentage points (to 20 percent) between 1979–81 and 1990–92.”. ^ Food and Agriculture Organization Economic and Social Development Department. “The State of Food Insecurity in the World, 2008 : High food prices and food security - threats and opportunities”. Food and Agriculture Organization of the United Nations, 2008, p. 6. “Good progress in reducing the share of hungry people in the developing world had been achieved – down from almost 20 percent in 1990–92 to less than 18 percent in 1995–97 and just above 16 percent in 2003–05. The estimates show that rising food prices have thrown that progress into reverse, with the proportion of undernourished people worldwide moving back towards 17 percent.”. Wikimedia Commons has media related to Starvation. Wilson, DE; Zeikus, R; Chan, IF (Apr 1987). "Relationship of organ lipoprotein lipase activity and ketonuria to hypertriglyceridemia in starved and streptozocin-induced diabetic rats". Diabetes. 36 (4): 485–90. doi:10.2337/diabetes.36.4.485. PMID 3817303. Swaner, JC; Connor, WE (Aug 1975). "Hypercholesterolemia of total starvation: its mechanism via tissue mobilization of cholesterol". The American Journal of Physiology. 229 (2): 365–9. PMID 169705.